I have to start off with apologizing for not updating often enough. Wish I could but it’s hard to find time to do so as well as find time to write about things that aren’t just “here’s what I’m doing now!” My goal of this blog is to help others with the role of a DIT as best as I can. So I’ll open it up to questions too. If you have a question about something specific regarding DITing, please leave a comment below or email me at Charlie@dorkinatent.com and I’ll make a post in the coming weeks answering questions as best as I can. Okay, on to the juicy stuff. I’m going to contradict myself immediately and say “here’s what I’ve been doing!” (don’t worry, I’m not going to have a post a week about every new project, unless it’s something regarding something helpful int he DIT community). May-June: DIT for a feature starring James Franco, Ed Harris, Amber Heard, and Christian Slater (fantastic guy btw) called The Adderall Diaries. More on this later as I was forced to buy a new mac pro (nMP) for this job and put that puppy to the test, hard style. Might just do a post specifically for that. Did dailies and live color and rendered 6 hours of footage every day with the nMP without a rocket, 25-40fps to DNxHD36, pretty impressive. July-August: On a Tier2 called The Outskirts, what I’m currently working on right now. The interface is pretty awesome. That “apply the last grade when LiveGrade starts” is CLUTCH! I can’t tell you how many times I’ve accidentally quit (or have my computer freeze and need to force restart) LG1 during a shot and then have to make an adjustment immediately afterwards, but not be able to do anything about it. LG1 would reset the grades upon startup, and if you’re like me and like to have a LOG signal coming out from the camera AND you’re feeding video village, then it’s no good to have the signal reset in the middle of the take, especially if it’s the director or producers watching. The remote app is pretty fantastic as well, but it’s only limited to applying different pre-made LUTs and enabling the False color, original signal, bypass color, & graded signals. Also you can’t access any of the created groups too (such as previous days) which is kind of a bummer, but hopefully it’ll be there soon. The modes are the same still, but have a new look and feel to them AND they’ve implemented ACES, which is fantastic! I really like the ACES mode, haven’t had a job come up in which I can use it, but just playing around with it on The Outskirts, it really looks nice with the Alexa. The Device manager for the LUT boxes is pretty awesome too. Very informative and I like that you can group different LUT boxes together so you can apply 1 look to both boxes and be able to control them both at the same time. Very nice for multi-cam work. 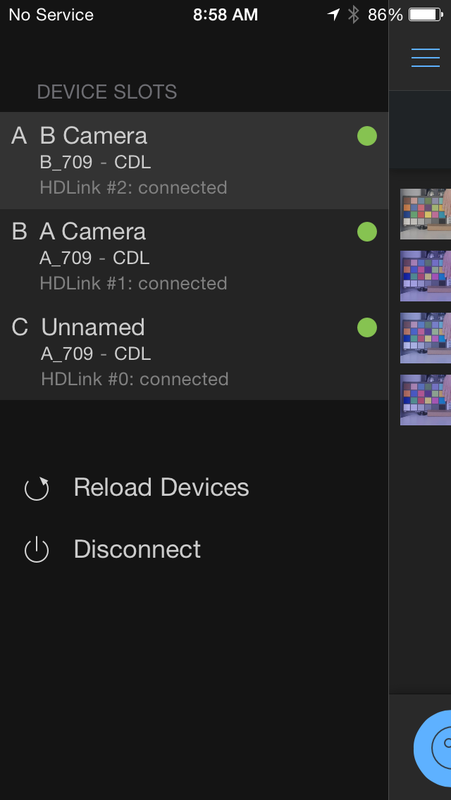 One thing I notice a lot is my HDLinks tend to switch the inputs a lot, so A port is B camera and B port is C camera and C port is A camera, even though everything is connected correctly (I use a switcher) it changes constantly. Might be something with my HDLinks but not sure if it’s a LG2 thing or not. A few features I wish I had would be to drag and drop projects from one to the other (such as different grade groups). I can export all the cubes and then re-import them, but would be nice to just do it all within the program. Also when you’re selecting different devices and you create a new grave with command + N, then you hit enter to rename it, you’re actually renaming the device, not the new grade you just made. Not a big deal but when you’re trying to work fast it’s a bit of an annoyance to have to constantly switch back and forth between the device and the grade you just made. I put in a ticket for it as a suggestion so we’ll see if that makes it’s way in to the new version.